This paper proposes the complete QoS architecture for integration of ad-hoc with infrastructure networks. The technology, service differentiation mechanisms, and signaling protocols are discussed. The modules required in the network elements and its integration to provide end-to-end QoS in mobile adhoc networks are presented. The proposed solution is based on the SWAN model with some extensions to provide L2 differentiation for four traffic classes and supports the integration with infrastructure networks. The deployed hierarchical architecture guarantees scalability and make possible per-flow resource management in wireless access where scarce radio resources should be managed effectively, and per-aggregate traffic management using a DiffServ model in the core. 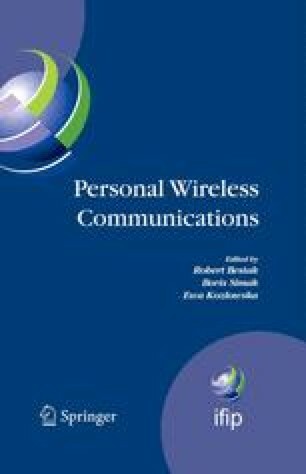 Please use the following format when citing this chapter: Natkaniec, M., Gozdecki, J., Sargento, S., 2007, in IFIP International Federation for Information Processing, Volume 245, Personal Wireless Communications, eds. Simak, B., Bestak, R., Kozowska, E., (Boston: Springer), pp. 25–37.